Sometimes a song, a quote, or other item just sticks in your head. Case in point would be the words of Dory. Yes, I mean Dory from Finding Nemo. 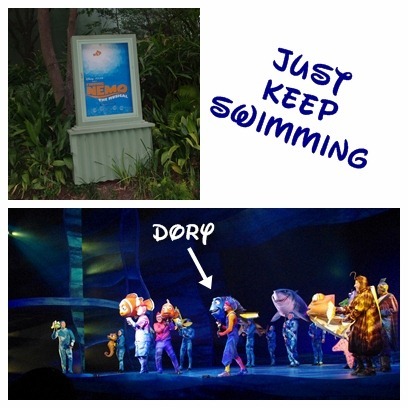 After seeing Finding Nemo the Musical while at Disney’s Animal Kingdom in May, her words have been motivating me. Which ones? For some reason, I often find myself singing along to the song from the musical. If you have never seen it, I highly recommend taking the time. Here is the song that has made an earworm into my head and keeps me plugging along. Thanks to YouTube, I found it posted by Ame Livingston who happens to be Dory in the video. What do you think about Dory’s words of wisdom to just keep swimming? More about this and some life lessons from Finding Nemo tomorrow.